This book turned out to be not at all what I expected. The first 2/3 are exactly what you think, and then it takes some crazy turns. I loved that it kept me on my toes. It has a happy ending but doesn't wrap everything up in a nice little bow. The only thing that bugged me at the end was that you don't see Sky's reunion with Six. It just seems like a loose end. update 6/27/13: I just reread this. I initially gave it 5 stars, then rethought my rating system & changed it to 4. I'm changing it back to 5 now. I LOVE Colleen Hoover. I love the characters she creates and her beautiful writing & the beautiful stories she tells. They're raw and real and wonderful. She takes on some seriously challenging topics, and can have you laughing while your face is still wet from crying two pages ago. This book, as I said before, does take a really surprising turn. It's not at all what I expected. There are all sorts of moral dilemmas and perseverance. 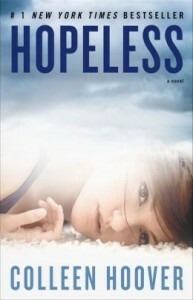 I haven't read Losing Hope yet, but I will be soon, and I'm really excited to. If you haven't read Colleen Hoover's other books, you need to. Like, now.